To celebrate the January paperback release of the excellent novel ‘The Hunting Ground’ by Cliff McNish, those lovely people at Indigo/Orion have provided Books and Writers with FIVE COPIES TO BE WON by readers of this blog. The following is my chat with the author of this great scare-fest, and you can read my review of the book here. After you’ve had a read of the review and the interview, please leave a comment below with your email address (using ‘AT’ instead of @ to confuse pesky spambots) and I’ll enter you in the draw to win one of the copies for your very own sleepless nights. KBW: Firstly, I loved the book, but found it a little intense to hand to my 11 year old daughter – what age group do think this suits best? CM: That’s a good question. Originally it was written with Elliott and Ben being 14 and 12 respectively. But the psychological darkness was so intense – Cullayn especially – that a late decision was made to up the age of the main protagonist to 16 and certainly from age 13 upwards is where I expect most readers to find a home with it. KBW: Is Glebe House or any of the events based on anything in reality or in your own experience, or is everything in The Hunting Ground pure fiction? CM: I guess I’ve looked around a few old properties in my time, taking in the atmosphere, and I have an interest in mazes, which is maybe where the labyrinth of the East Wing originated – but overall it is just an invented composite that suited my purpose. KBW: How did the doll being dragged across the floor and its head bouncing along come about? – That’s an image that still stays and haunts me now. CM: Real life scares me all the time. Illness. Death. Physical and mental decline. That kind of stuff. In fiction, I’m scared when an author makes me like a character and then does things that are totally unexpected but feel psychologically true to them. KBW: Do you have a favourite ghost story in fiction? And in film? And I assume you must have seen The Woman in Black on stage? CM: I don’t have one single favourite ghost story, although two I’ve read recently have impressed me for different reasons. 1. Strangers by Taichi Yamada – an adult Japanese ghost story that is deceptively simply written and very beautiful and cold. 2. My Brother’s Ghost by Allan Ahlbeg is as wistful and beautiful a ghost story for kids or adults you’ll ever read. Guardian short listed many years ago. Films … mm, tricky one. No one single favourite, though the Spanish film THE ORPHANAGE was very very good. KBW: Do you have a set writing place or can you write more or less anywhere? And are you committed to a writing regime/set hours etc or just when the mood takes you? CM: I’m very workmanlike, doing plenty of hours once I have the story clearly set in my mind and know where I’m going. Until then, I’m all over the place! I tend to do it all in my study but I can write anywhere if I have to — as long as I have a computer! KBW: What’s been the stand-out book that you’ve read in 2011? CM: Great question. I’ve been disappointed by quite a few. Especially Justin Cronin’s THE PASSAGE, which took me a month to read! Maybe the most stay-in-your-mind good was Amanda Coe’s debut novel WHAT THEY DO IN THE DARK – a decidedly adult novel, but whose main protagonists are children. KBW: What can we look forward to next from you? Many thanks to Cliff for taking time out for this and, if you want to scare yourself silly with his book, then enter a comment and your email below – Good luck. Filed under Contest !, Interviews, Prize draw ! A great interview! 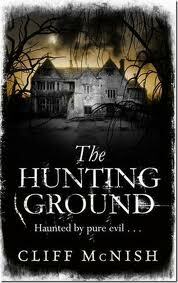 I read The Hunting Ground and really enjoyed it.